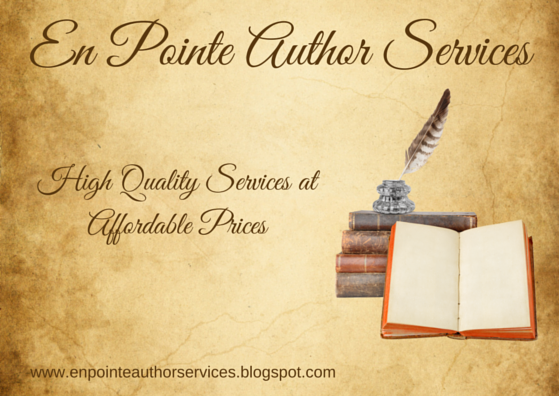 En Pointe Author Services offers the following services: Author Assistant Services such as social media promotions. Editing Services Blog Tour Services Come check us out! Includes: Book Blurb/Synopsis, Cover Photo, Author Bio and Social Media Links, Goodreads Link (If available), Pre-Buy Links (If Available), Exclusive Excerpt (If Available), as well as any other Promotional Materials Provided by the author. Social Media guaranteed on En Pointe Author Services Facebook Page, Twitter Page and Teatime and Books blog. Can be done on short notice, however I do recommend atleast 1 week. Includes Book Blurb/Synopsis, Cover, Author Bio and Social Media Links, Goodreads Link (If available), Buy Links (If Available), Exclusive Excerpt (If Available), as well as any other Promotional Materials Provided by the author. Can be done on short notice, however, I do recommend atleast 1 week preparation. Includes Book Blurb/Synopsis, Cover, Author Bio and Social Media Links, Goodreads Link (If available), Buy Links, Exclusive Excerpt (If Available), as well as any other Promotional Materials Provided by the author. Includes: Reviews, Excerpts, Promo Stops. Authors may also choose: Guest Posts, Author Interviews, Character Interviews, Play List, Top 10 List, Dream Cast and any other options you’d like to offer to the bloggers and add into your tour. You can fill out the form below to request an event organized by En Pointe Author Services. Or you can email your request to me at enpointeediting@gmail.com You can expect a response within 48 hours. Note: Once you’ve signed up for a tour, you will be sent a packet pertaining information and materials needed for your chosen tour. Please refer to our Blog Tour Information page before requesting a tour to understand what En Pointe Author Services can do for you and what we ask of you. All materials on this page were produced and/or compiled by En Pointe Author Services. Upcoming Tours - Sign Up Now!